The King’s School coat of arms in the version used by Canon Shirley. The King’s School does not have its own coat of arms but uses a version of Canterbury Cathedral’s. The post-Reformation School was run by the Cathedral and the King’s Scholars are still part of the Cathedral foundation. Some accounts claim that the Greek letters [iota, chi] stand for Jesus Christ. (The official title of the Cathedral is ‘The Cathedral and Metropolitical Church of Christ at Canterbury’.) However, Thomas Willement in Heraldic Notices of Canterbury Cathedral (1827) p.6 states: ‘The letters on the cross are evidently an abbreviation of ‘Christi’, the Church having been so dedicated.’ Thus it is properly chi, iota: hence the lower case iota in many versions. 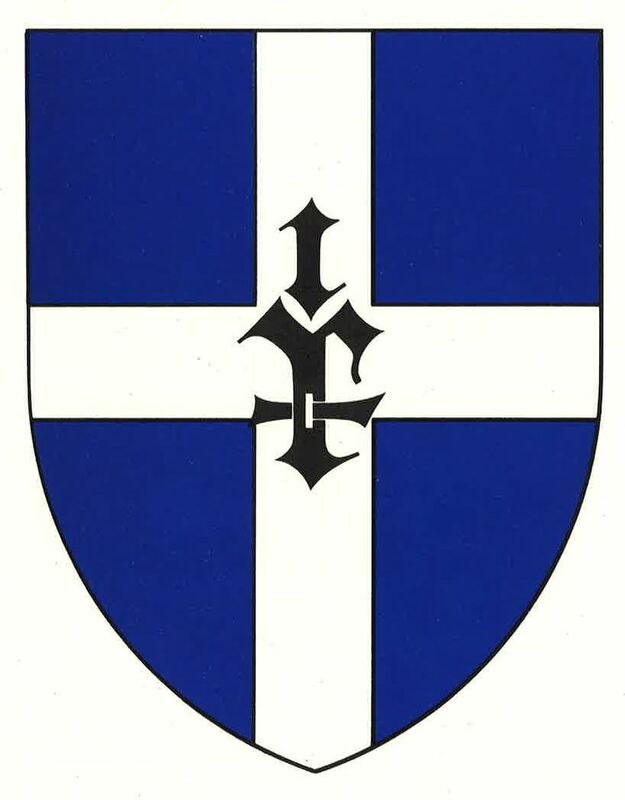 The heraldic description is: ‘Azure, on a cross, argent, the letter Χ, surmounted by the letter i, sable’. There have been several variations in the shape of the shield and in the design of the letters. Canon Shirley used the Gothic Xi (illustrated): it survived in the rotulus until 2000. In that year there was a shift to a new version on most official School publications. This was further modified in 2014. The School does not have a motto. Thomas Field (Headmaster 1886-96) introduced ‘Age dum agis’, which was fairly widely used in the late nineteenth and early twentieth centuries. It has not survived.